I’m more than a little obsessive about my work. It’s funny, because when I’m not in the middle of a draft, I love to have a million things going on and I thrive on the variety. But when I’m focusing on a particular project, I shut everything else out and pretty much eat, sleep, and breathe my work in progress. This is both good and bad I think! 2. Sometimes an author begins writing a story before they are aware of its genre. Did you choose your genre, or did it choose you? I knew this one was going to be sci-fi! 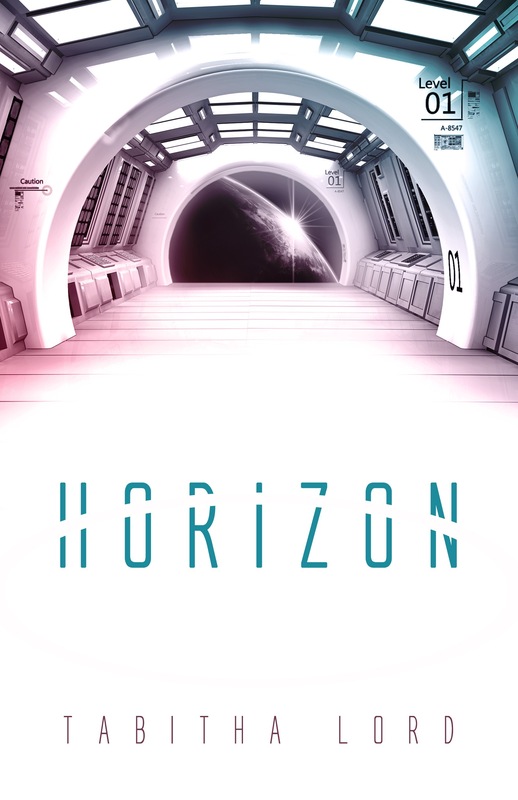 When I started thinking about Horizon, I had two distinct parts of a story floating in my head. The first was the opening crash sequence. It was more basic at the time of its inception – just a young man who crash lands on a planet, and a young woman, in some kind of trouble, who saves his life. The second part was more complex. I was playing with the idea of what would happen if one segment of an already small isolated population evolved differently, either naturally or by design, from the other. What if some had gifts that enabled them to imagine a different kind of future for themselves and their world? What if they were empathic and could sense each other’s emotions and thoughts? What if some of them could heal with their mind? How would the unchanged people feel about their neighbors? It created such an interesting premise I knew I had to find a way to make it into a story. And of course, it couldn’t really be anything but sci-fi! 3. The plot thickens, or does it? Which one are you, a pantser or a plotter? I’m a loose outliner or plotter. Generally, I have the concept for the book well worked out before I dive in, but I leave plenty of room for interesting plot twists. I’m not sure my characters face any of my personal fears, but at a writing conference I once attended, the speaker suggested that we artist types, through our work, like to contend with themes that are important to us. This really resonated with me. Some of the questions I need my characters to struggle with include: What decisions do we make large and small that come to define us when it matters? What does a hero look like? Who stands and fights, and who turns away? What is redemption and who finds it? I think about these things in the context of current world events, and I want to encounter these kinds of questions as a reader. I think it makes sense that I would write about them too. Absolutely not! I’ll be honest – I struggle to find balance. It feels like there aren’t enough hours in the day to write creatively, promote my existing book, network, blog, edit, etc. And there is still a household to run! I have four kids, so a good bit of my world still involves baseball games, piano recitals, concerts, school plays, and feeding the masses. I handle the madness by being an obsessive-compulsive planner. I have a daily to-do list, a monthly project list, and I live by my calendar. I’m a Board member at the Waldorf School where I used to work and teach, and I’m still on a few committees there, so I plan those things in as well. I try to hit four power yoga classes per week and I hike on Thursday mornings with some friends. I go out of my way to schedule my work around these two things, so I guess I may have found some measure of balance! When I was working full-time outside my home, I made time to write and I protected that time fiercely. Now, other things weave their way into my day and cut into that valuable time. It requires real discipline, and a detailed calendar, for me to stay productive. One of the first scenes in Horizon shows Caeli saving Derek’s life with her empathic/telepathic healing powers. I was an EMT for many years, and worked in the ER for several more. I’m actually a medical school dropout, but that’ a story for another day! It was important for me that Derek’s injuries, and Caeli’s approach to healing them, be accurate. BUT, if I had been out there in the middle of the wilderness instead of Caeli, well, that would have been pretty disastrous for Derek! I imbued Caeli with all the magical healing powers I always wished I had. Right now I’m at the kitchen table. In the winter, sometimes, I’ll grab the beanbag chair from my son’s room and sit in front of the fire to write. And in the spring and summer, I love to drag my computer and notes onto the porch to write outside. I really would suffer greatly without chocolate in any season! 9. You are introduced to your favorite author. Who is it, and what is that one burning question you must ask them? I really don’t have one favorite author. I like different writers for different reasons. But, I’d love to ask the great Stephen King how he could possibly have so many stories floating in his head! He is one of the most prolific writers of our time, and an absolute master storyteller. If someone asked me to write a horror story about a car possessed by an evil spirit, or a rabid dog, or a kitty that comes back from the dead, I’d laugh. But honestly, Pet Cemetery kept me up all night with the lights on! I’m in awe of that. Not necessarily the ability to scare someone, but to be so powerful with your words that you completely immerse them in your world – as unbelievable as that world may be. Well, this is more a quirky Tabitha thing because I did it even when I worked in an office. I talk to myself. And sing under my breath. All the time. One of my colleagues used to throw things at me, but most of them ignored me. Now at home nobody pays any attention. My daughter actually said to me, “Mom, writers have to be weird or their writing wouldn’t be interesting.” Thanks, I think! Well, that depends on if you need to pay the bills! I am plenty busy with writing projects, blogging, reviewing, and interviewing, but much of this work is done to create a community and a good reputation in the writing world, not for the paycheck. As I work on building a backlist, and receive offers for other writing projects, I’m starting to see some income, but my experience certainly isn’t instant wealth and fame! It’s worth it though and I’m in it for the long game. Thank you, Danita, for hosting me today! Great to have you here Tabitha! Congratulations on your exciting release. I really enjoyed your comments. This excerpt was really outstanding.